As a makerspace developer, you know that most discussions with stakeholders about automation risk are met with a healthy sense of disbelief. You can almost hear them saying that this is just another fad like virtual reality. Unfortunately for working class Americans, investors are starting to surge into robotic stocks. In response, you could also imagine that most stakeholders would probably say that young people always invest in the newest shiny object. 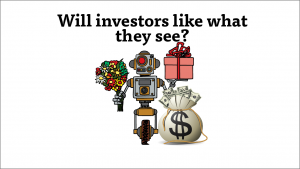 The difference between robots and other so-called fads is the fact that elderly investors in Japan are starting to pore money into the market for robotic stocks, which is expected to reach $150 billion dollars by 2020. This is a game changer because elderly Japanese have access to a substantial amount of family money. Elderly investors in Japan are like institutional investors in the United States. They can engage in market making, which means that they fund much larger bets. Their efforts will also draw other savvy investors into the markets. The arrival of market makers is generally a sign that a nascent market is set to take off. It’s also a signal that you and your community need to start planning a mitigation strategy. And that strategy must include some level of makerspace development. Not all makerspace development efforts are made the same. Some start with a large well established community of creatives. Others require a lot more upfront work to build the kind of stakeholder community that can support a local makerspace. Either way, the end result must be a larger creative class. PS: If you would like more makerspace development in 2016 and you’re in the US, text the keyword “makerspace” to 44222 on your smart phone. Otherwise, Click Here to Subscribe to our email list.